Life as an Autistic Person Confounds Me and it is Awesome! Life with autism confounds me, or I should say it used to until I learned I was autistic and suddenly life made sense. When I was little people were the most confounding creatures. I found my mother illogical and weird, and she found me cold and distant; occasionally mean. I didn't know I was autistic then. I was just me. When I was little, everything seemed to be as big as the universe. Nothing was ever a little deal. I've since learned that I have hypersensitivity. Things don't just seem a bigger deal to me. They are a bigger deal. But when I was little, everyone just thought I was melodramatic. So it confounded me. My mom is a pretty good cook. It's a wonder that she has no idea how nice she was to me considering I had no idea why I didn't like food then, either. Sometimes the way food felt in my mouth bothered me. I like peas, but they explode in my mouth, so I don't like peas. I like potatoes, but everytime I'd ever eaten them, they'd come right back up. So food confounded me. When I was little, little pictures were seen and not heard, so I didn't have privilege of the exposure to adult interactions that little kids get today. The only reason I got to hang around with the adults was because I was enormously shy. I wasn't so shy, I was petrified of children, they were mean, they were loud, and they were violent. So even though there were gads of kids to play with, I far rather'd hang with my Dad. He understood me while the kids confounded me. When I was little I hated the feeling of clothes touching me. I couldn't stand the tags rubbing against my neck. I got rashes where the clothes touched me and I was constantly covered in rashes. When I was little, I was told, it's soft, it's nice, when I found it picky and itchy. So, clothes confounded me. Ultimately, I think in being an undiagnosed Aspie, I got lucky. My life unfolded in such a way as I had to learn how to deal with it, because I didn't have any reason to not. I didn't have the luxury of explaining all my little idiosynchracies away as Aspergers Syndrome. So, I'm going to be 50 on my birthday in December. Life continues to this day to confound me. So, here's the bad news. None of these issues have gone away. I'm just as confounded on a daily basis as I was when I was a child. And contrary to what some autism groups suggest, that is not a bad thing. It's just a thing. In fact, once I'd figured out how to deal with and alleviate these difficulties in my life, I grew up to be a pretty cool person because I'm different. My parents looked for the special in me and focused on what I was capable of doing, trying never to compare me to other children. So, they didn't really look at my odd milestones and see them as setbacks or savantism, they just saw these wonders of their baby girl growing. They taught me that I am not my challenges, they are simply issues I have to deal with. I'll never outgrow these challenges, but as I get older, I continually learn new coping skills and mechanisms that make my autism less stressful and confounding. I'm lucky, most days, I'm pretty calm and function pretty well. But sometimes I can't function well at all. So my life is arranged in such a way as to have the supports I require when I require them. When I can't function... the ball gets picked up and sorted on my behalf until I'm back functioning again. Usually, I'm out for a day maybe two at worst. And then I pull it back together and life is totally awesome. Until the next challenge hits, like the shingles outbreak that I'm about to endure for the third time in the last five years. Or the illness I will have to deal with tomorrow morning because I had conventionally grown vegetables for dinner. Or because my shirt has gotten so annoying that I've gotten trapped in it trying to get it off. I like to joke that if I bump into three walls before I get out of my bedroom in the morning, I go back to bed. Being autistic isn't easy somedays, but any day, it's me, and embracing it is a lot better for my sanity than fighting it. So, on bad days, life will most assuredly continue to confound me. On good days, life is awesome. This blog was written for Autistics Speaking Day 2015. To raise Autism awareness and Acceptance, and battle negative stereotypes about Autism. To advocate for the inclusion of Autistic people in the community. To offer a forum to broadcast our stories and thoughts, and to help the messages of Autistic people and non-Austistic allies reach as many people as possible. I invite you to click here to read some of the other blogs that were written in honour of this day. We share these words so you can know how absolutely awesome people with Autism are, regardless of our challenges. I'm autistic. I'll be 50 on my birthday. Did you know that there are adult autistics? It's a lifelong neurological condition we cannot simply remove. Autism Speaks' mission is to change my future. They don't know that the best parts of me are BECAUSE I'm autistic. They do not wish to listen to Autistic voices. The problem with finding the missing pieces of the puzzle is that you're not actually using the EXISTING PIECES to solve it. Ask an autistic person what it is like to BE autistic. Ask the autistic person what THEY need. Stop giving donations to Autism Speaks and put your money where people will actually LISTEN! I was a day late to the Studio and two late for the Psych conference but I lapped up what I managed to attend! OMG... life changing. 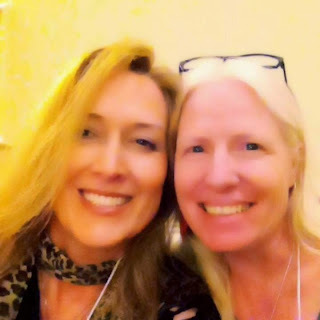 This is me at RS 2015 with Donnaleigh de laRose. Carrie Paris; you are my new Goddess a million blessings on your house for the love and healing you shall encourage on my pathway. Theresa Reid, your encouragement, your faith and assurance that I would get to the conference! It was worth the Cobalt Blue... what a gift! Dan Pelletier, as always for your friendship and your encouragement along my pathway. Every heart I touched, every heart that touched mine. I thank you and bless you everyone! See you all next year. 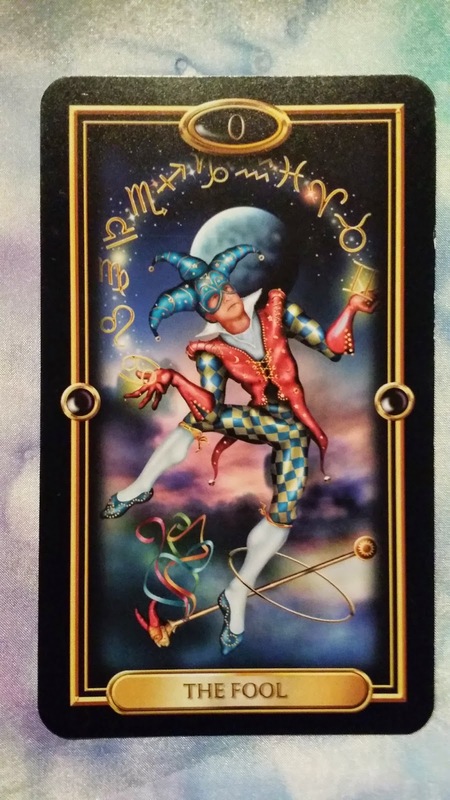 I got an email from my firned Christine Aguiar who is working with James Battersby on the highly anticipated Cultural Revolution Tarot, asking me if I was up for doing a review of James' latest deck. 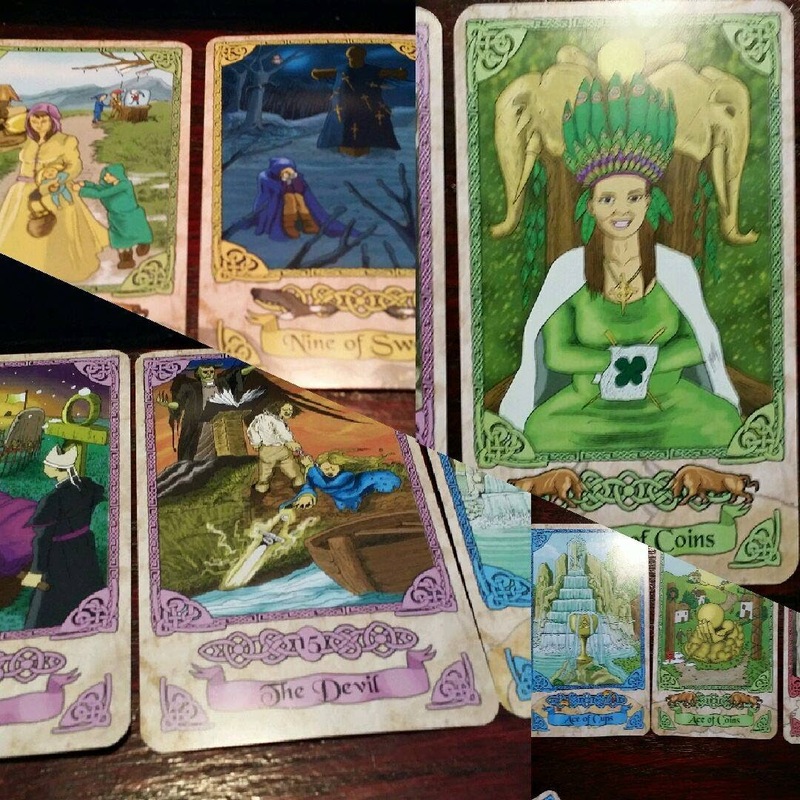 The King's Journey Tarot - Bordered Edition that she was working on. Knowing how amazing the original deck was, of course I said, yes, so here is the review. Now some of you may be thinking, "HEY! I have that deck in my collection!"... and you'd be mostly right. 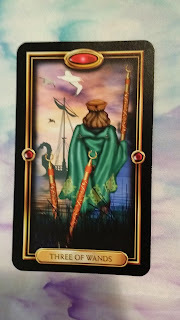 The original King's Journey Tarot was published in 2010 by my friends, Chanel Bayless and James Battersby. 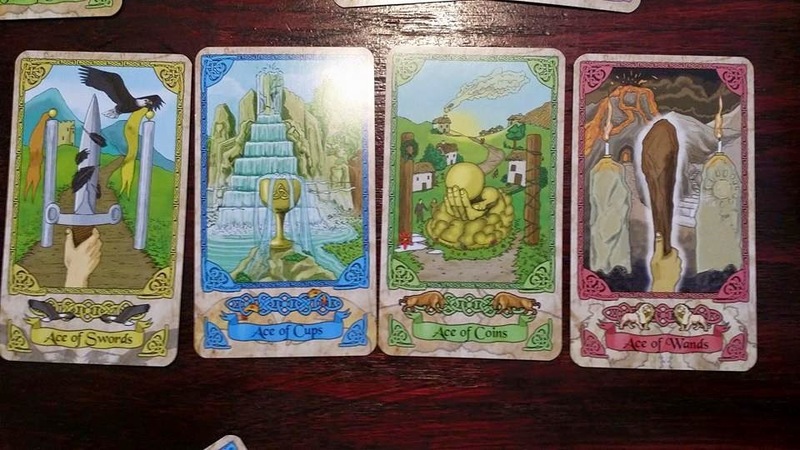 As you can see, the cards had no borders or numbers and the reader was left to decipher the card by the image. A stunning deck, but many young readers find it difficult to connect with. James says that he'd always wanted the borders and numbers, especially since he is an artist first and comes to the tarot by way of his art. This new release is THAT desire come to fruition. 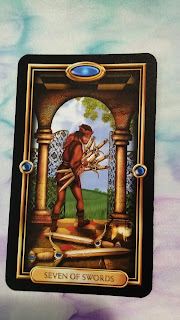 Chanel declined participating in this deck revival as she walks a different pathway, so James called on Tarotist, Christine Aguiar to help him to stay true to the card meanings. Well, yesterday I opened the deck. It came wrapped in printed newspaper that I had to take great care not to rip. And in a purple and silver tulle drawstring bag. My first thought as I fanned the deck? What beautiful colours. The Borders really stand out and lineate the cards. 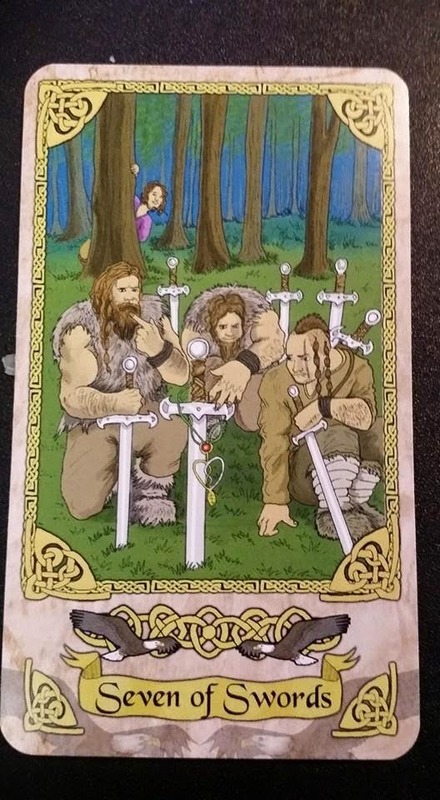 James has inked beautiful Celtic designs all the way around the cards that frame the images beautifully while creating a frame under which the names of the cards have been painted on scrolls. 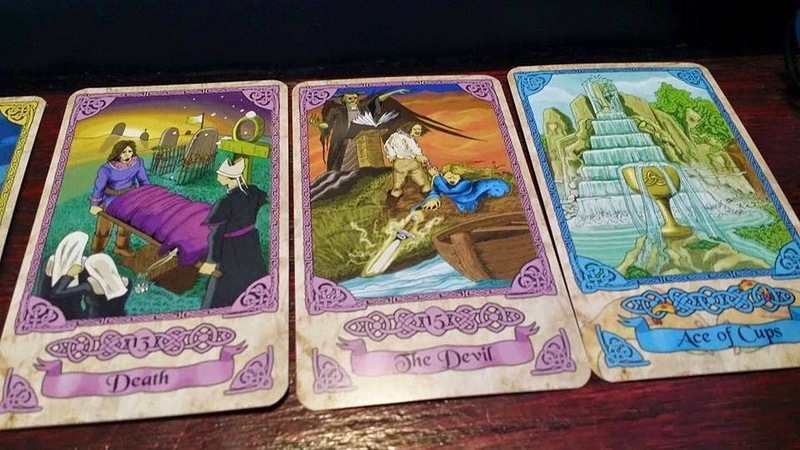 He's suitably chosen colours to match the images; green for Coins, blue for cups, yellow for swords and pink for wands and lavender for the Major Arcana. If you are an owner of the original deck, the first thing you notice is the minimization of the beautiful images that James painted. The artwork is absolutely stunning. I understand why Chanel chose him to work with originally. This deck is less shocking in its presentation, which, in my mind, is going to make it far easier to be used by tarotists as their working deck. Per my usual procedure for getting to know a deck, my first action is to have a conversation with the deck to see how well it thinks it can read for me. Decks never lie, and it doesn't matter how well or how poorly they are painted. Well, this deck responded to my request for introduction with the Hierophant. Which is to say, I will be your teacher. At first, I thought it was a pretty arrogant response for a deck to take with me, but, the voices I hear when I read are so varied, I didn't think much of it... yet. Having had a little chat with the deck, I will do a series of cold readings for people. 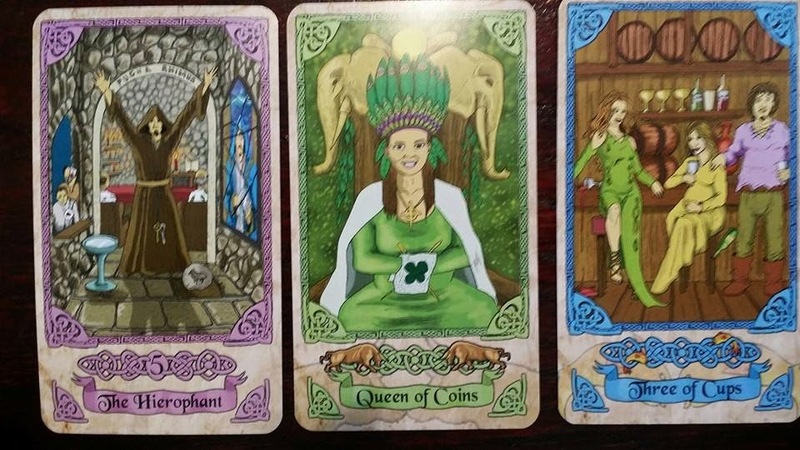 Usually, I'll do them on one of my tarot groups where I am exposed to other readers, but this time, decided that I wanted to show off my "talent" to a group of friends who live in my area but aren't familiar with my reading ability. So, I offered a series where I would do a Tarot Twreading for whoever in that group wants one. I got about 20 takers. 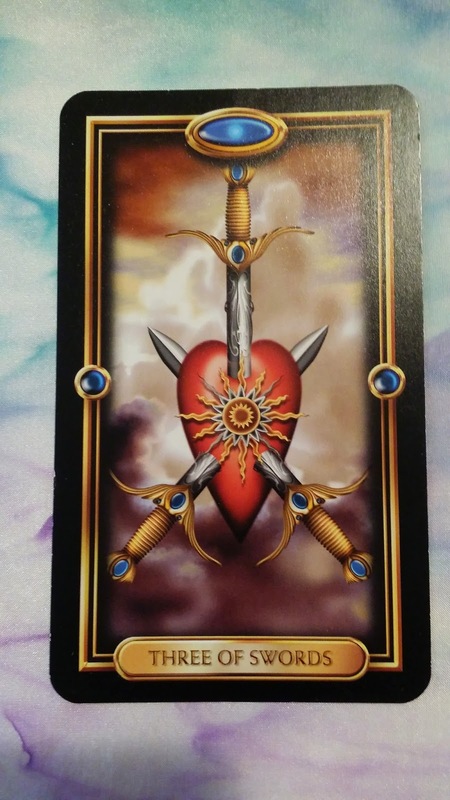 The most impressive image of the day was when the Seven of Swords presented itself in a reading to represent a group of bikers. The querant tells me that the young woman peeking out from behind the tree is VERY reminiscent of her. She showed me a photo, and so it is. Needless to say, the cards sang to me, they gave me information and images that I have yet to truly experience with any previous deck. My heavens this deck is lovely to talk with. I like it, like it, like it. 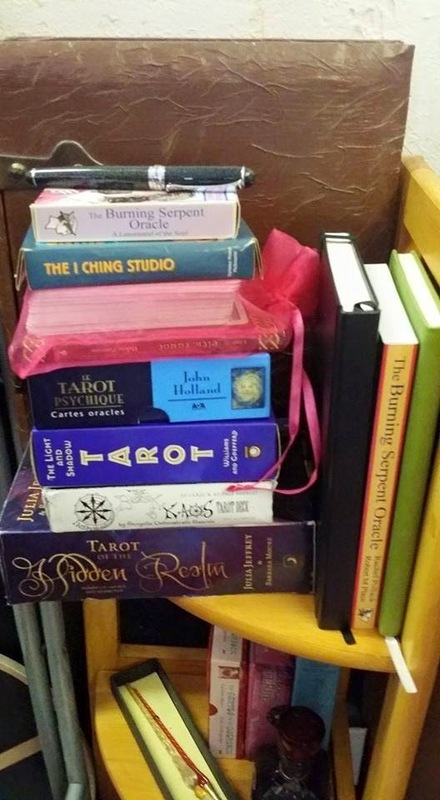 The learning curve for a deck is often tricky for tarot readers as the tarot images are sometimes vivid and clear and other times obscure and difficult. These images are anything BUT obscure. Testament to its beginnings with Chanel's knowlege and expertise of the tarot and James skill as an artist, these images are quite expressive. Now, I'm an intuitive reader and I only really know the "book meanings" of the Tarot because most artists paint them. In this case, the paint is true (at least for the cards I've read with so far). And since my readings don't care if I understand Tarot or not, the images in these cards work very, very well with my intuition and as an extension, my spirit guide, Melody. I invite you to read this deck. I hope you find it as warm, friendly and talkative I have. And if not, it is a beautiful addition to your collection. Thanks to Christine and James for gifting me this beautiful voice. I truly look forward to offering it as one of my working decks. 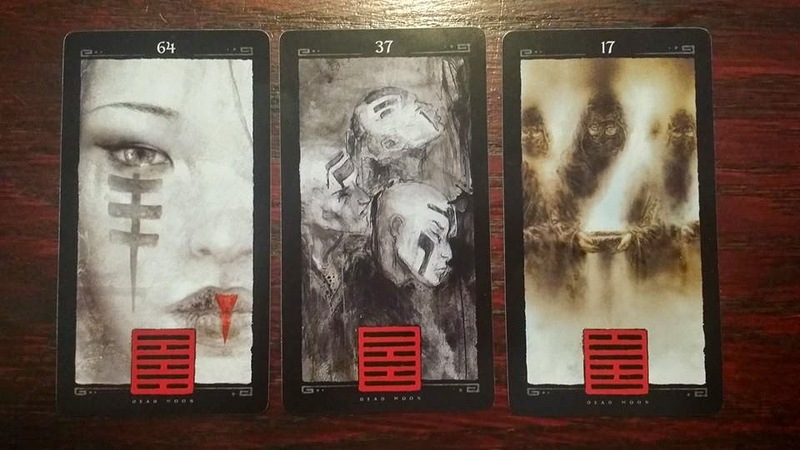 iChing Dead Moon a Tarot review and an iChing lesson. When I first started reading the Lo Scarabeo iChing Dead Moon cards, I was doing it backwards. I was reading the tarot and expecting the iChing to fall into place. It wasn't working. Then I thought, try it the other way around. When I was a teenager, I'd learned the iChing using pennies I carried around in a native medicine bag, so, this should be a piece of cake, right? Each of the iching symbols represents a specific energy. They are done in pairs, because the interactions between the two create an even more intricate depiction of the energy of the card. When you read them as tarot style cards, the images on the card SHOULD add to the "human" understanding of the energy; If the energy depicted feels different from the energy of the glyph, then it's not going to work very well. So far they are playing nice. Then energy flows very well if you can see/feel it in the iChing. I didn't understand that until I did my first iChing Dead Moon reading; even though I'd used it all those years. Ambitious, I have to relearn the iching meanings, differently. This could be a brilliant adventure. I blame Dan Pelletier. There are eight trigrams only. But each trigram is coupled with another to create the iChing's 64 tiles. Once you have a feeling for the iching, then the detail in the tarot card comes to life. I'm enjoying this course. I look forward to being able to use this deck as my working deck. If you learn both... it's more in keeping with the original creation. (IMNHO). So, here we are 2014, holiday season at hand and I make the crazy volunteer bid to write a Yule blog hop! I am not sane. Surely, nobody this busy, of sane mind would participate in a blog hop. Well, here I am doing one. Go figure. 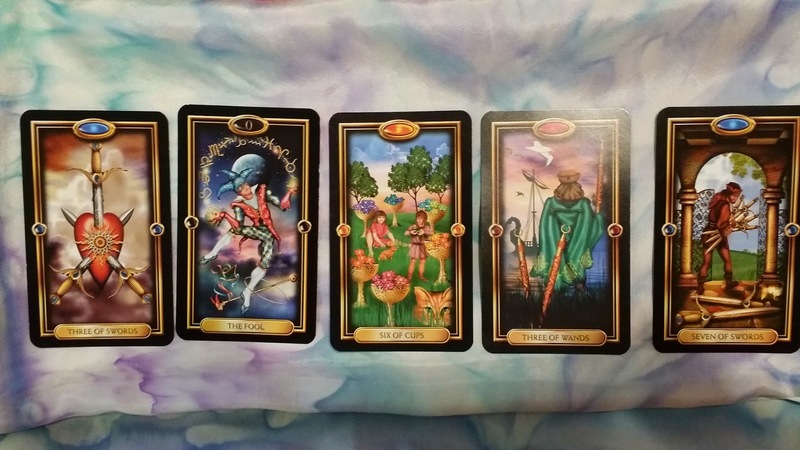 So, to begin with, this is one of those Tarot posts. Because, well, it's a Tarot Yule Blog Hop. The idea of the hop is to do a reading for the season, with several distinct ideas about gifting. Something I feel VERY strongly at sharing solely based on the gifts I have been given repeatedly and honorifically again and again and I am so grateful for it. This blog hop is an opportunity for me to share that feeling of blessed gratitude. After all, THAT is what gifting is all about. If in giving you a gift, I can fill your heart with love and your eyes with tears, then I have successfully shared the great gift of gratitude that I live on a daily basis. I know that as you read my blogs, I'm found discussing all sorts of things, and I don't think I've done a spread here before, but today, I gift you this spread. If you're a newbie to my blog, welcome. 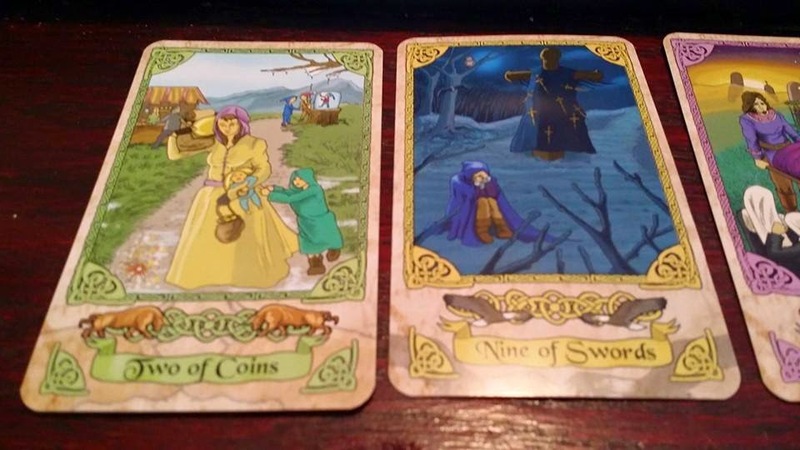 You can read my Tarot profile by clicking here (although it is out of date). The rest of you, carry on reading, we're going to see what Melody has to share on this wonderful issue. Here is the spread in question. And today, Melody is using the Gilded Tarot, my favourite deck from Ciro Marchetti. The Three of swords. A card much feared and hated by many because it expresses the difficult to deal with energies of sadness and loss. The gift of this card is the lesson of freedom that comes from sharing one's sorrow and embracing it by transforming it into love. 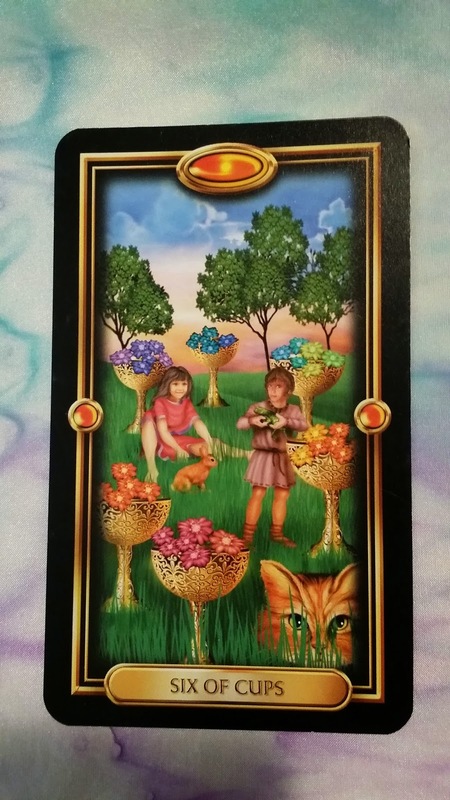 The gift of acceptance that this card brings embraces the idea of coming to grips with life, no matter the difficulty, so that one can move forward, solid, loving and healing. We are creators, without embracing all of our emotions, we leave our strengths and solidity behind. So, I give the World the gift of Acceptance. The Fool. New beginnings, new adventure, new ideas, new, new, new... Freedom means that every day is an opportunity for changing that which has gone before. We are creators, every day we can recreate our entire world in our own image. Whatever we wish to see in this world, that is what we will see. The Gift I would want from the world; the ability to take advantage of the freedom to start anew. So the gift I would want from the world is Freedom. The Six of Cups. This is a card about blessings and plenty. Memories of great joy and bliss and contentment. Sunshiny afternoons and green pastures, stretching lazily in the sun like a cat. The gift of joy given to me through these cards shows in this card. I feel the warm loving energy of all that is, and all that ever was in this card. And I have absolutely been living the gift of bliss that Melody has taught me through these cards. Today, more especially than any day previously, and the best part of it is the perpetual perfection of it's threat to continue to always get better and better as time goes on. So, the gift is my commitment to seeking bliss and the outstanding gratitude for the blessings I am receiving as a direct result. I must pause in the reading of the cards here, as I starting this reading on Tuesday of the week preceding Yule. 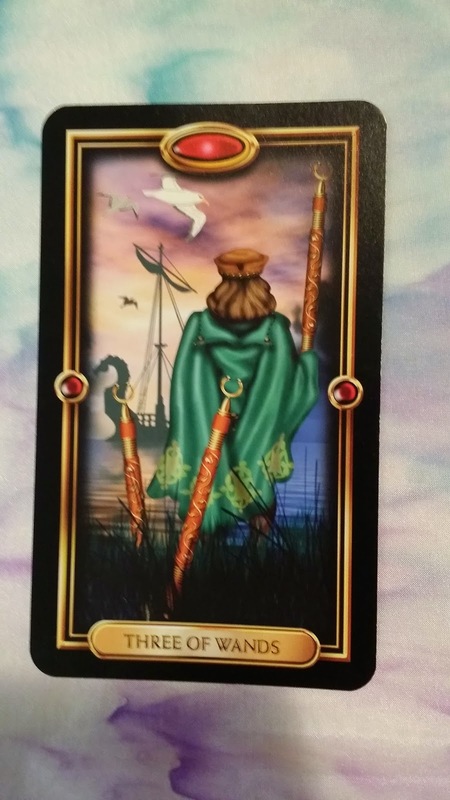 Before I read the following two cards, I experienced a personal drama in my life of epic proportions, the sort of which I have come to know herald a major change in my physical direction and pathway. And so it is with Yule, each year. It brings the end of a cycle and begins a new one. Every year is a gift. I didn't always feel that way. Once upon a time my most dreaded time of the year was Christmas. I have spent so so so many years in pain and in tears over the awfulness that Christmas has always been. A time of careful planning and ridiculous expectations all so that people who don't spend time with each other usually can get together and catch up on what they're missing in these other people's lives. I end a year of working with the power of myself with the destruction of piece of my heart that I can never get back. Trust is like that. It takes a lifetime to build and single moment to dash it to pieces. When such things happen, it is a message from the Universe that your time here is done. That this phase is over and it is time to move on. There is melancholy, pain even sometimes in such growth, but I have learned to trust Melody longtime hence to guide me along a golden pathway towards the spirit of love and light that we all are and can become in this lifetime. So even before I read these last two cards, I experience a profound sense of gratitude for this lesson in the dying days of the year. And I step forward with a sense of reticence but great joyful gratitude that the coming gift of a new path is before me. I return you now to my regularly scheduled blog hop. "What gift have you given that has brought you joy?" Three of Wands. Here is a card that denotes a phase that requires forward movent and growth, a journey of spiritual significance awaiting he who embarks. It is inspired, and offers a promise of completion worthy of the voyage. This speaks to the gift that I have been given in learning how to release the past in my existence and to maintain my focus on the present, even through some pretty trying situations. Knowing from my experience that there is always an adventure on the other side of every moment and being able to share that adventure with people through my cards, brings me great joy. So the gift that has brought me the greatest joy is my ability to gift the adventure of life. What is one last thing you'd like to share this season? Seven of Swords. Here the energy is that of one walking away with the best energies, and there is the remorseful sadness that not energies will move forward, perhaps lost, perhaps never again to be seen. But the sun is coming through the clouds and even without those things, it's going to be okay. This card in response to this question reminds me of the Bible Verse/Pete Seeger Song Ecclesiastes 3/Turn Turn Turn. So the gift is one of seasonal renewal. As the year ends and the new year begins, go forward in peace knowing that all is well, and everything happens in its own time, whatever the reason, t'is but for a season.